With Valentine’s Day just around the corner, it’s time to decide where you’ll make a reservation for the most romantic evening of the year. With this list, you won’t have to think too long—we’ve rounded up the most romantic restaurants in every state. Picture it: It’s sunset. You’re staring down at multi-million dollar boats docked at a golden-cast harbor as you sip sparkling wine and feed one another locally-sourced scallops, prepared by a James Beard Award-semifinalist. That is the romantic scene you can set with your significant other at Fisher’s Upstairs at Orange Beach Marina. Don’t judge this book—err, restaurant—by its cover. 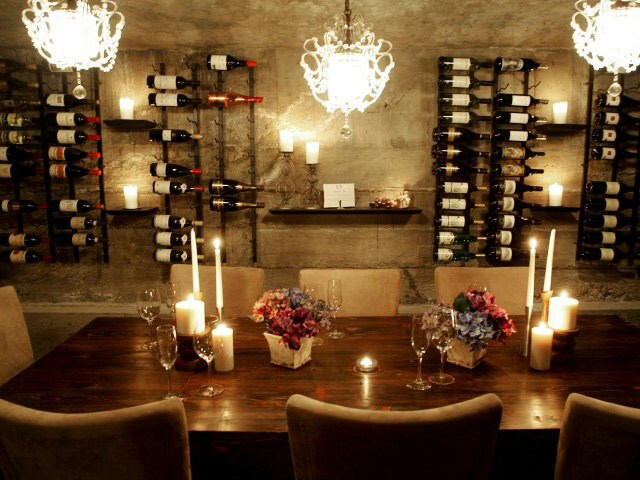 In the basement of this 1930s pioneer home-turned-restaurant is a dimly-lit wine cellar complete with stone walls. Here, you can indulge in a wine flight as you get to know your love a little bit better. Lon’s Restaurant offers not one but many romantic settings for an intimate dinner experience: an outdoor dining space surrounded by low adobe walls and nearby mountains, an indoor dining room illuminated by candlelight, and a wine cellar that offers seating for 12 people, perfect for your next double—or sextuple—date night. Old world elegance awaits you and your date at Arthur’s Prime Steakhouse, where wood paneling and stone details deck the walls and staff are decked out in tuxedo shirts and bow-ties. But the real wow factor isn’t in the décor—it’s actually behind closed doors, where patrons can rent lockers in the restaurant’s wine cellar. Rent one, and a staff member will serve your private bottle during your next date night. Perched atop the cliffs of Big Sur—soaring some 1,200 feet high and with panoramic views of the Pacific Ocean—is Sierra Mar, a restaurant set inside the Post Ranch Inn. On a clear, warm night, patrons can dine on the restaurant’s patio under the stars. When you want nothing more than to cozy up in a cabin with your loved one, head to Beatrice & Woodsley, a restaurant that was designed to bring Colorado’s stunning outdoor scenery inside to a rustic, cabin-like setting, complete with lantern lighting. Set on New Haven’s historic waterfront, Shell & Bones Oyster Bar beckons lovers to warm themselves by fires—inside and outside. And its nautical décor and floor-to-ceiling waterfront views will transport couples on a mini-vacation, if only for dinner. Enjoy eating in what was once an old blacksmith’s shop—with hooks still on Krazy Kat’s Restaurant’s walls—then stroll through the restaurant’s grounds and gardens. Latitudes offers the ultimate experience in romantic privacy: you must take a boat to reach this secluded space. Once here, you can dine outdoors, with the ocean’s breeze gently blowing through your hair and a sunset over the Gulf of Mexico in your sights. Located on the banks of the Chattahoochee River, Canoe brings guests right up to the water, on a patio offering views of both nature and manicured gardens, where couples can stroll after dinner to escape the hustle and bustle of nearby Atlanta. Poised on the edge of the ocean, Merriman’s Restaurant offers more than just views: Couples can snuggle up to one another on intimate couches—or embrace by outdoor fire pits as the sound of crashing waves serve as background music—while they eat. Forty-One South sits on the waterfront of Lake Pend Oreille, a beautiful sight from inside the restaurant’s nearly floor-to-ceiling windows. While you may spot snow outside, you can keep yourself and your date warm by a wood-burning fireplace. Step into Ella Elli, and you almost step back in time to the 1920’s, where loveseats designed for two and alcove booths—private booths—reign supreme. A meant-to-be shared menu adds to the romantic ambiance inside. Take a spin—quite literally—with your love at the Eagle’s Nest, a rooftop restaurant that revolves 360 degrees, offering unparalleled views of the city skyline all around. It’s as romantic as the classic Ferris Wheel—only with wine and linen tablecloths. 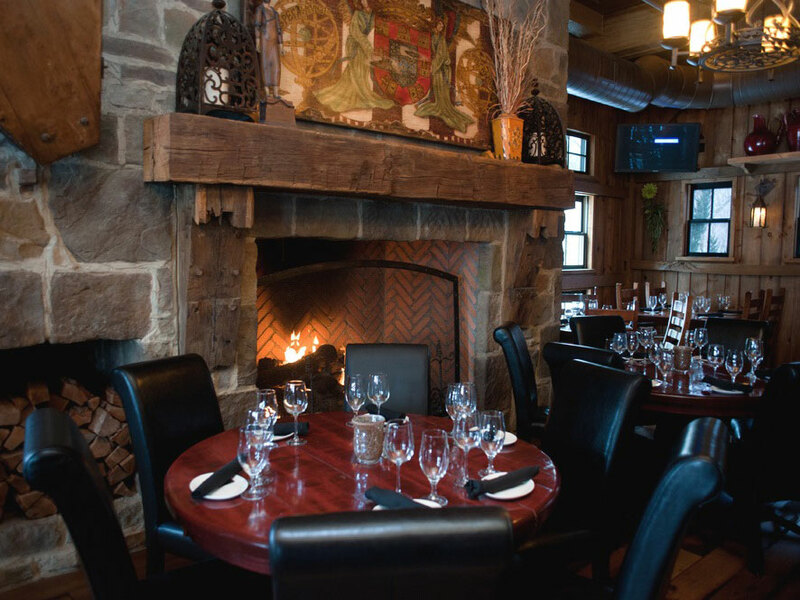 The centerpiece to Salt of the Hearth—if the name didn’t already tip you off, that is—is a roaring fireplace smack in the center of the restaurant. Velvet floor-to-ceiling curtains add elegance and, of course, a bit of privacy lovebirds will likely appreciate. Hotel restaurants have an allure all their own. Throw in the floor-to-ceiling wine display featured at this mainstay on the second floor of the Ambassador Hotel, and you're sure to have a good night. People may have dubbed The English Grill the most popular restaurant in Kentucky, but with its oak wood panels and equestrian artwork—plus a list of more than 400 wines to choose from—we hereby name it the most romantic restaurant in the state. The expansive French doors on this old New Orleans mansion sweep open into the most charming courtyard, bedecked with gas-light lanterns, a three-tiered fountain, and tables tucked right into the foliage. But Café Amelie’s menu was also made with romance in mind; its oysters—a known aphrodisiac—are delicious any time of year. If the epic views of Oarweed Cove from M.C. Perkins Cove’s floor-to-ceiling windows don’t put you in a romantic mood, then surely its extensive raw bar options will. With the Bluebird Cocktail Room, romance starts with the restaurant’s name—it’s named after a poem—continues to the bar, where hand-cut ice allows pairs to linger over drinks, and continues into the dining room, where crystal chandeliers, a fireplace, and made-for-canoodling golden seats beg couples to get a wee bit closer. Make a reservation for Yvonne’s library room, and you’ll soon be cozying up to your loved one by the Locke-Ober’s original fireplace, which dates back to 1832. You can order drinks and small plates meant to be shared, then pull a book from the library’s shelves—one of which houses a first edition Peter Pan—and read to one another. Prime & Proper’s 10,000-square-foot space mixes textiles—patina brass, cowhide and leather, intricate tilework, tufted velvet, white marble, and aged woods—that scream intimate space despite its behemoth presence and fine view of Capitol Park. Walk into Spoon and Stable and you may feel as if you stepped into a chef’s house—albeit a very design-savvy chef’s house. Banquettes are made even more homey with the presence of throw pillows, while Oriental rugs warm up cool-toned wood floors. You could get lost in your lover’s eyes—or you could get lost in the view from The Chimneys, which, set on the Gulf of Mexico, offers both views of the sea and of the ancient, moss-covered live oak trees that survived the worst of Hurricane Katrina. When you want to dress to impress—in a setting that can be described as more city-chic than intimate and candlelit—look no further than Touch Restaurant & Oyster Bar, where you’ll find two floors of stylish décor and conversation-starting artwork. Where there is romance, there is (very often) wine. And that’s just one reason Plonk Wine Bar—which boasts dozens of wines by the glass and more than 400 wines by the bottle—makes our most-romantic restaurant list. The other? It has a rooftop bar where romance can blossom over one of those bottles and under the twinkle lights. At Timber Dining Lodge, the farm comes to your table—and into your sights. Seated beneath a soaring timber-wood ceiling, you and your date will have views of Arbor Day Farm, which has rolling green fields that seem plucked from a Jane Austin novel. 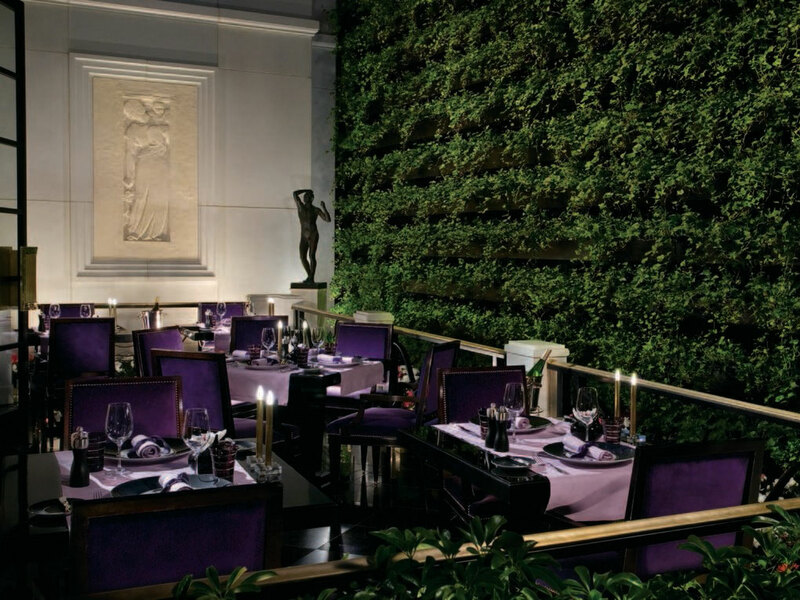 When you want a space that exudes decadence, look no further than Joël Robuchon, which boasts walls draped in velvet and an 18-course menu that will wow any date. Three of your senses will go into romantic overload at Ristorante Massimo, where exposed brick walls, oil paintings, and candlelight greets your eyes; Frank Sinatra croons in your ears; and prime, Grade-A steaks and fine wines tickle your tongues. Inside, you’ll find traditional romance—think: crisp white linens and candlelight—and something more exotic—a room with an eclectic Moroccan theme, including brass lanterns, gold-hued walls, and wood-carved paintings. 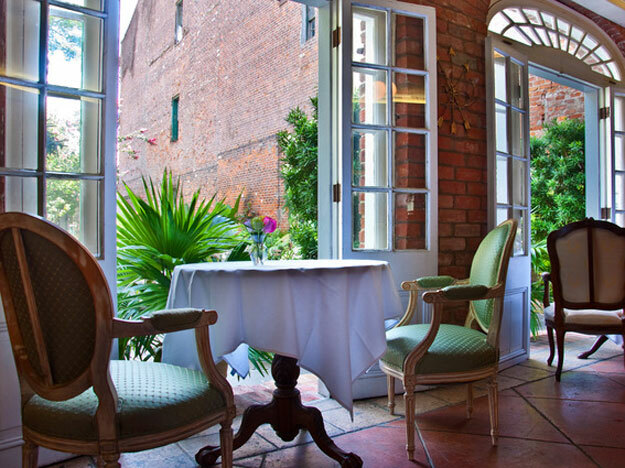 But if you don’t get the feels inside Café Matisse, you will feel your romance bloom in its outdoor garden. Harley Viera-Newton, model, It-girl, and DJ, chose One if By Land, Two if By Sea as the site for her wedding. If that doesn’t convince you of this restaurant’s romantic virtues, then perhaps its history will tug at your heart: the 1767 carriage house it occupies was the home of Aaron Burr, and was named after a Paul Revere poem. Nestled in the majestic Blue Ridge Mountains—and framed by verdant forests and meadows encircled by thousand-foot cliffs—is Canyon Kitchen. Take in the views, with a cocktail in hand, on the restaurant’s front porch before your meal, or step into the backyard—a manicured garden—for a nightcap under the starry night sky. With large windows overlooking downtown Grand Forks, Sky’s offers the best view in town. It’s also got a lounge made for lovebirds: it’s got private sectionals where you can cozy up with a handcrafted cocktail and get to know one another better. Take a stroll through the vines at Gervasi Vineyard before sitting together near the restaurant’s fireplace or outside, with views of weeping willows and a large pond. Soaring some 762 feet over downtown Oklahoma City, Vast is, well, vast: inside the restaurant are a vast bar space, a vast Edison-bulb chandelier, and, of course, vast floor-to-ceiling windows for that vast view—a vast, epic setting for an epic romance. Quick, what’s more romantic: a lighthouse, a beach, or an island? If you can’t choose, that’s actually A-OK. At Stephanie Inn Dining Room, you won’t have to pick between the sights. The restaurant offers views of the Pacific Ocean, Tillamook Lighthouse, and Haystack Rock, a large sea stack (think of it as a mini island) in Cannon Beach. Talula’s Garden is the indoor-outdoor restaurant of your dreams. With reclaimed-wood tables and green couches inside and the smell of fresh herbs on the outdoor patio, it’s almost like you took your date home—if you had a service staff at home. The Chanler at Cliff Walk has been named the most romantic hotel in the U.S., so it only makes sense that its signature restaurant, Spiced Pear, would ooze romance as well. Ask for a table with ocean views—and an accompanying ocean breeze—as you indulge in a menu that features iconic items such as butter-poached Maine lobster. ​The walk to 82 Queen—along a narrow, gas-lamp-lit alley—is romantic enough, but at the end of that walk couples will find even more romance: a garden courtyard, the perfect place to dine under the stars or sit and slowly sip a glass (or bottle) of wine. Minerva’s Restaurant is the perfect nightcap to an evening out—its location near the Washington Pavilion, local movie theater, and sports center make it so. But even if you begin your night here, you’ll have a very romantic evening: on the weekends, there is live music on the weekends to serenade you and your date in the dim light. Pop a bottle of champagne—or sip on a hand-crafted cocktail—under the pergola at Rumours East, which also boasts the best, most romantic patio in East Nashville. 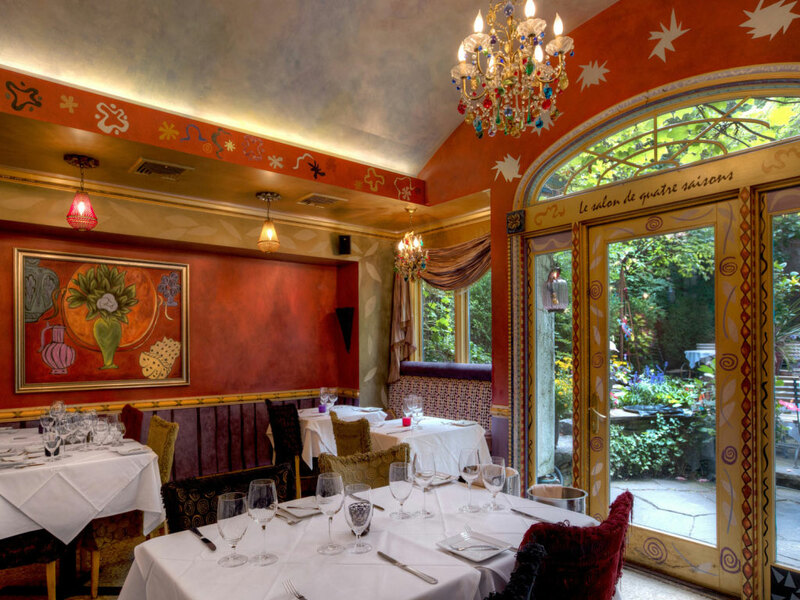 The French Room, as its name suggests, is the epitome of fine French architecture: it has soaring arched ceilings with gilded Venetian plaster and crystal chandeliers. In other words, you can bring your date to France, without having to buy a plane ticket. According to inside sources, The Roof is a popular destination for Mormon lovebirds to pop the question, and that may have a little something to do with the restaurant’s stunning sky-high view of Temple Square. Upping the romance factor is a Plexiglas piano—one of only 75 such pianos in the world—playing softly in the background. Hen of the Wood offers the coziest of settings: stone walls, wooden rafters, and comfortable leather seating combine to create the most warm, inviting dating space. Set inside the Jefferson Hotel, which was built in 1895, Lemaire Restaurant today looks unchanged from the day its door first opened—eight separate dining spaces are each adorned with different details: cream-colored marble walls, wood-burning fireplaces, and crystal chandeliers, each evoking a romantic and luxurious ambiance. The most romantic evening of your teens—a night at the local fair, of course—is reimagined at The Pink Door, where you will find trapeze, cabaret, music, and even tarot-card reading—in addition to amazing food—within view of iconic Elliot Bay. American cuisine with French flare and an extensive wine list set the date-night tone at Laury’s Restaurant, which offers views of Charleston and the Kanawha River. 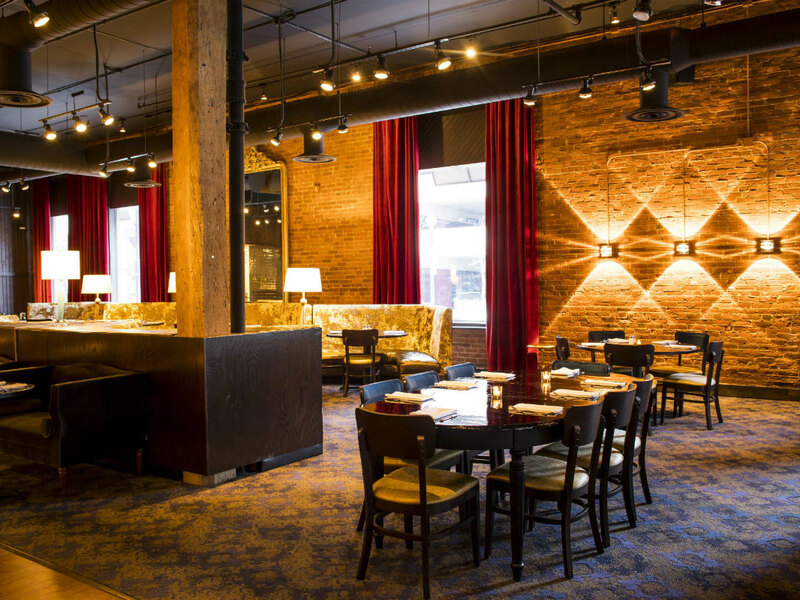 A romantic environment can be created with the right light, and that’s exactly what Lovechild does with individual, low-lit lamps beside every bar stool and banquette that cast just the right glow on the space’s exposed brick walls and metallic finishes. Glorietta Trattoria brings a bit of Brooklyn-chic to Jackson Hole—it was, after all, designed by a Brooklyn firm—which makes a meal here almost like a mini vacation out of the country and into the city. And we all know vacations are super romantic.